OK, things are a bit quiet but I'll see if I can get a blog post out of it anyway. 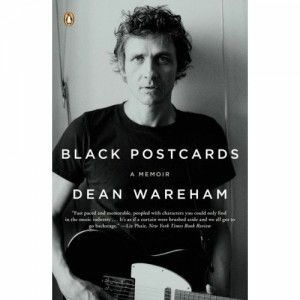 The list-obsessive Rolling Stone web site have just published their 25 Greatest Rock Memoirs and Dean Wareham's Black Postcards pops up at #22. Damon & Naomi played recently at the Eugene Mirman Comedy Festival on a bill with Tanya Donnelly and Bill Janowitz and Chris Colbourn of Buffalo Tom, amongst others... haven't heard anything but Bill Janowitz did tweet a fuzzy picture of Damon & Naomi on stage. Frances Ha is in cinemas (it opens in the UK at the end of July) and features cameos from both Dean & Britta, keep an ear out for some instrumental backing music by Britta, that has turned into a song for the soundtrack album. In case you missed it I chopped up and posted Dean Wareham's diary from their tour around Europe with the Velvet Underground in 1993. Don't forget about Oblivious - a Tumblr blog where I dump anything that I come across, or that comes into my head. I recently came across a video of Galaxie 500's appearance on BBC TVs Snub from back in the day. I have shared this before but this new video is better quality. While I had heard Galaxie 500 prior to this being broadcast it was this TV appearance that cemented Galaxie 500 as my favourite band and Snowstorm as my favourite song two things that still stand over 20 years down the line.